There is a thread Do (Women Like their Rolex)So let's start this one about men. So what do you men think about your Rolex and the one you own? If you don't have Rolex do you want one our thinking about buying a Rolex? No, don’t like or wish to have a Rolex. The style and mechanics are certainly not the best and we all know there claim to fame is all about status, period! I don’t know Mike, but one difference is, that if a Rolex has a £3000 price tag on it in U.K., that’s the price you’ll pay if you buy it, but I’m guessing, but I don’t know for absolute sure, that a $5000 Rolex in the U.S., would be plus tax. I only say this, because like a lot of my countrymen, it came as a surprise to me when I first visited your shores, and bought merchandise, like shirts, pants, and shoes, when the clerk would say, “That’s $X sir, plus tax. It wasn’t until I’d made two or three trips to the U.S. that I started to remember that almost everything was plus tax. In the U.K. it’s already factored in, apart from some stuff, like auto parts, and tools etc., auto servicing, tyres, (or tires if you wish), which attract VAT, (value added tax). Thank you for the information. I may be in the UK next year and wondering where I stand. Love mine and nothing gaudy about it. Just a nice dress watch. Plenty of ghetto looking ones out there that lack class and are over the top. Just buy what you prefer. Rolex, like other watches depend on model, extras, etc. when it comes to price. Your basic submariner is aound 5k stateside, then just name your poison after that, be it gold in the band, saphires, diamonds, etc. plenty of other super expensive watches out there like Patek Phillipe that make Rolex priced like a Timex..
A good watch is the best jewelry for a man. For men I really like the Hublot watch but as a previous poster pointed out, buy with resale in mind. I have a Dior VIII Montaigne Ladies Watch (fashion watch) and now that I want to sell it. I won't be getting my money back. Last edited by petch751; 01-28-2019 at 10:29 AM.. Does anybody know if a Rolex is less expensive in The UK than in America? Maybe, maybe not. Stainless steel (SS) models are even more scarce to source from an AD in the UK. As an example the SubC Date, MSRP in UK Oct 2018 was 6550 pound sterling which is $8627 USD. Whereas the MSRP in US is $8550. If you factor in tax, than maybe it will be cheaper, but again, with most ADs having very little stock of SS models you might not find the model you want. You appear to know very little about watches in general and Rolex in particular. While I'll try to include a couple of articles for your reference, I can't make you read them of course. If you prefer to wallow in what appears to be ignorance in matters of horology, please rest assured that you were confidently self-taught. First up is reputation. What company wouldn't want Rolex's reputation among consumers? Second - charity. Did you know that Rolex is owned by a non-profit trust and that the Hans Wilsdorf Foundation is a recognized charity? History of Rolex. Third - patents. You'd be hard-pressed to find a watch manufacturer with more patents than Rolex. In the US alone, there are seven pages of patents listed here and that's clearly not the entire list. The number of 'firsts' by Rolex is extensive. Even it's reputation among experts is solid. Ariel Adams is one such expert who recognizes their position. You might enjoy his article here. Another 15 minute read.... - good article to boot. From a personal perspective, I've owned six or seven Rolex watches from my mid-20's to now, in my 60's. I've never lost money on one when I decided to sell it and purchase a new or pre-owned one. I prefer un-worn, pre-owned since those are the best values. My current GMT is freakishly accurate but then again, the one prior to this one, a Explorer 1 was also accurate. 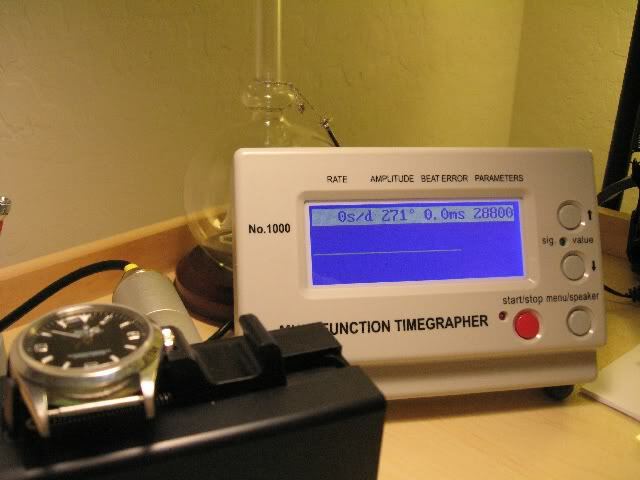 Here's that one, over 25 years old, on a timer. Accurate, strong amplitude - across all five positions used by the COSC to insure accuracy. Are there more expensive watches? Better made? Retain their value better? Of course but, name one in the same range of cost as any Rolex which retains its value at least as well as a Rolex. Very few items are less expensive in the UK than the US. As teqp accurately stated, the demand for stainless models is much greater than the supply. As an alternative, I've had stellar results both buying and selling on the Rolex forums. Once you've identified a 'trusted seller', the rest is easy and the prices, better than the dealer in many cases current supply issues not withstanding. Last edited by k7baixo; 01-30-2019 at 08:42 AM.. Fellow TRFer! SS models are crazy hard to get if you go the AD route without having a relationship with them already. As k7baixo stated in his other post about not losing money on owning a Rolex is very true. I can actually sell my Omegas for more money than I paid as well as my Rolex watches. Buying from a grey dealer can save money sometimes, but not always. It will, however, help you get your watch faster nowadays. A regular SubC Date that has an MSRP of $8550, a grey dealer is now asking $9500 to over 10k. It's gone crazy, unfortunately. I remember the good ole days when you could walk into an AD and see every model. Now the display cases have plenty of empty spots. Look at the BLNR's/Batmans on this page. Holy smokes. Mine isn't (relatively) new like these but I could still easily get my money out of it if I wanted to. I don't....I suspect my daughter will get it when I'm...done. I've got a Zenith El Primero and an IWC that I could sell for more than I paid for them. The secret? Wait until the next market crash - you can pick up a pre-owned Zenith that sold for $10,000 for well under $4000. While I don't look at watches as an investment, at least at that price, you'll never lose money on it. The Zenith is a big ole honkin watch to boot. The El Primero is one of my grail watches. Just spectacular. I will have to tolerate my Sinn 103 st sa, and Omega Speedie Pro until I can justify one. Rolex makes some great watches. There in house movements are pretty bullet proof. I would love to have a Sea Dweller also. Classic.